Once upon a time, yours truly disliked German Metal veterans Grave Digger. Part of that was Chris Boltendahl’s raspy voice. And still, despite the great music, I think that what is considered the band’s classic album, 1996’s ‘Tunes Of War’, is marred by Boltendahl attempting to do more than his limited range allows him to. In recent years, he seems to have embraced his shortcomings. On 2003’s ‘Rheingold’, the entire band was on fire. Since the band’s early ninties reunion, they tried to combine their Speed Metal roots with a Power Metal sensibility, with the speedy riffs of the former and the bombast and big choruses of the latter. ‘Rheingold’ is the ultimate marriage of both. 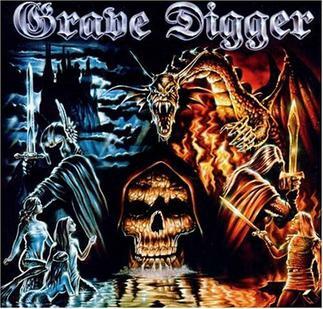 Based on Richard Wagner’s opera adaption of Germany’s legendary ‘Nibelungenlied’, ‘Rheingold’ is one of Grave Digger’s many concept albums. Their most accomplished at that as well. The symphonic elements used much more as a complimentary thing than is usual within the Power Metal framework, especially when it’s used as an interlude accompanied by the band, such as in the awesome ‘Giants’. As for the choirs in the choruses, that’s something Grave Digger has been doing since the reunion, they’re just more present here. And better arranged. ‘Rheingold’ also really profits from having Manni Schmidt on guitar. No disrespect to Uwe Lulis before him or Axel Ritt after him, but Schmidt is by far the band’s best guitarist, with the only true contender being Thilo Hermann, who teamed up with him for ‘Ballads Of A Hangman’ only. His past in Rage already prove he was very proficient riffer and his leads have a certain off-the-cuff looseness to them uncommon to the genre, but still undeniably Metal. And those riffs are just killer. My favorite is the opening riff to the title track. That’s the kind of stuff that gets my blood pumping. I don’t want to take any credit from the impressive drumming of Stefan Arnold and the bass playing of Jens Becker, which is far above German Power Metal average, but Schmidt is on fire here. Despite the fact that Grave Digger always has had four distinct types of songs – fast songs, midtempo songs, epic stuff and ballads, although nothing on this album fully qualifies as the latter – ‘Rheingold’ displays a surprising amount of variation. The dynamics in ‘Maidens Of War’ and ‘Murderer’ are impressive. The band excels in fast songs (the title track, ‘Valhalla’, ‘Giants’), but also in midtempo stuff (‘Sword’). It gets even better when the band mixes it up (‘Twilight Of The Gods’ – strangely misspelled “Twighlight” in the booklet – and especially ‘Dragon’, listen to that song and you’ll realize that’s why you listen to Metal in the first place!). The band has been accused of being too much of one thing in the past, but that certainly isn’t the case here. It may have taken me a while to give Grave Digger the fair chance they deserved, but it’s albums like these that just pull me in. ‘Rheingold’ would also serve perfectly as an introduction to the band’s work, together with the excellent ‘Excalibur’ (if only to chuckle at the ridiculous German pronounciation of the title), the speeding frenzy ‘The Reaper’, the inspired ‘Heart Of Darkness’ and ‘Ballads Of A Hangman’. Their recent ‘Clash Of The Gods’ is pretty cool too. The riffs of “good old” Heavy Metal and the choruses of Power Metal. You won’t hear me complain!